Have you heard about Dryer Balls? 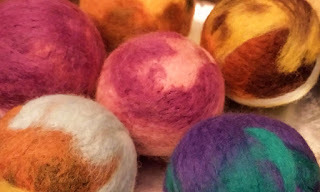 No need for expensive dryer sheets or fabric softeners, just wool dryer balls. Grey Heron is on the move…. Our last day open in Collingwood will be Thursday July 13th. It’s been our pleasure to look after you for the 9 years we’ve been in Collingwood. We hope you will visit us at our new location. We will be reopening the first week of August. We will carry the same fabulous yarns that we currently do, so when you need more – call us and we will mail it to you!! These “Thrum Mittens” have been hand knit in the traditional Canadian way by inserting wool fleece “thrums” into the mitten to create an extra layer of warmth. Traditional, Thrum Mittens were hand knit by coastal communities like our Nova Scotia, Prince Edward Island and Newfoundland regions to protect the fisherman’s hands from the frigid Atlantic waters. 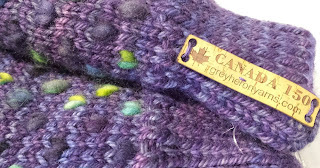 As part of our “Canada 150” yarn shop celebrations, these mittens have our specially designed label by Jelinek Corkhttp://www.jelinek.com/ made in cork on each of the mitten cuffs. The yarn and fleece come from a Nova Scotia hand yarn dyer “Fleece Artist” who crafts magnificent colours in each of their products. & The Royal LePage Shelter Foundation. Have you been away from knitting for a while and now want to rekindle your Knitting Spirit? Then this 3 hour course is for you!! Grab your knitting or crocheting and head over to Grey Heron Yarn Shop at 65 Simcoe St, Studio 1, Collingwood. 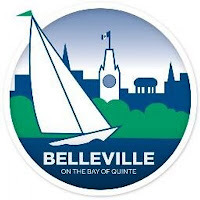 We are located in the old Enterprise Bulletin building on the corner of St. Marie St and Simcoe St in the Art District of downtown Collingwood. In this class, we will teach you how to knit in the round and get you started on this lovely cowl project. 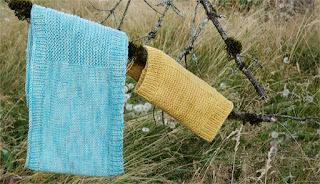 During the class, you'll cast on for the Oats cowl pattern by tincanknits. Ribbed edging, Knitting & Purling, Markers, Longtail Cast on Date: Saturday, February 11, 2017 ·Time: 10:00am-12:00pm ·Fee: $30.00 per person, not including materials. ·Class Size: maximum of 8 students ·Registration: Class must be paid for in full at time of registration to hold your seat. ·Skill Requirements: Must be able to confidently cast on, work in the round, knit, purl, and bind off with little to no assistance.